As Roman towns got bigger, in the course of the Roman empire, it got too hard for the people who lived in the towns to get drinking and washing water. Because raw sewage was draining into the rivers, people who drank river water often got very sick or died. Local governments, first in the city of Rome and then elsewhere in the growing Empire, decided to build long stone channels to carry clean water from nearby hills to the towns. These were called aqueducts, from the Latin word for water (aqua) and the Latin word for channel (ductus). By the time of the Empire, most Roman towns had at least one aqueduct to bring in fresh water, and big cities like Rome had ten or more. 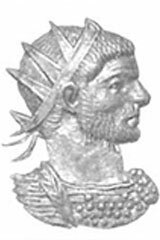 Lebanon was a part of this large Empire, many roman constructions dating from the roman era was found allovers Lebanese territories: temples, theaters, aqueducts. 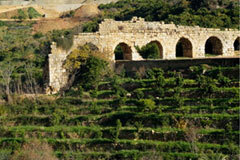 Located in the secluded river valley between Mansourieh and Hazmieh are the remains of a little-known Roman aqueduct. During the Roman period, with the expanding urbanization of Beirut, the demand for running water outgrew the capacity of the existing wells and springs. The solution was to get water from one of the springs located along the Beirut River. The nearest spring was the "Daychounieh" source, situated 20 km southeast of Beirut. The Roman architects built a water channel to convey this water across the Beirut River and transport it onwards to Beirut. It was built over an arched, bridge-like structure known today as 'QanaterZubaida' The aqueduct consisted of a series of arches of which only a small number remains on the sides of the river It was built in 273 AD, during the reign of Roman emperor Aurelian. 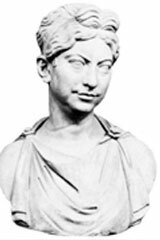 The name Zubaida can be identified with the famous al-Zabba'/Bat-Zabbai/Zenobia of Palmyra, who may have built it. It can also be associated with Princess Zubaida, wife of caliph Harounar-Rashid. 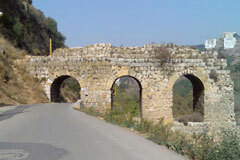 Curiously, another Roman aqueduct on the Nahr Ibrahim (Adonis river) bears the same name.